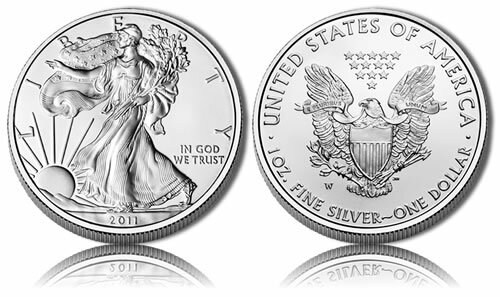 The 2011 American Silver Eagle Uncirculated Coin marks a return to a series of strikes dating back to 2006. The United States Mint released the 2011-W, or West Point minted, uncirculated Silver Eagle on September 15, 2011 at a price of $60.45. The Mint also announced that it would release a special 2011-S, or San Francisco minted, Silver Eagle in late October within its 5-coin 25th Anniversary American Silver Eagle Set. The uncirculated coins were struck annually until the United States Mint canceled their production in 2009 in order to divert all available blank planchets towards the Silver Eagle Bullion Coin. Investors were purchasing the bullion coins in record numbers which proved problematic for the Mint as is struggled to keep up with demand, which it was required by law to do so at the time. The Mint also cancelled the 2009 Proof Silver Eagle that year. In 2010, the Mint returned to issuing the Proof Silver Eagle, but failed to bring back this uncirculated version. That omission was corrected in 2011, however, as the Treasury Secretary was given the authority to strike the numismatic Eagles even if the demand for the bullion coins is not being fully met. Uncirculated Silver Eagles have three values associated with them — a face value, an intrinsic melt value and a numismatic value. The first and lowest is the face value which for the Silver Eagles is $1. This is the denomination struck on the coin by the United States Mint and the amount for which the U.S. Government backs its use if it were to be used in commerce. Second, the coin is struck from one ounce of .999 fine silver giving it an intrinsic melt value approximately equal to the ounce of the precious metal in it. Put another way, the coin is always worth the ounce of silver it could be melted down to. Third, and nearly always the highest value for the coin, is its numismatic value. This is the amount the coin is worth to other coin collectors. This value is generally higher based on the rarity and condition of the strike. Also, those Eagles slabbed and graded highly by an independent third party grading service are typically worth more to another collector than similar strikes which have not been graded. Uncirculated Silver Eagles were initially sold in 2006 and appeared for three years. According to the Mint, 198,553 individual Uncirculated Eagles were sold in 2006 along with 248,875 in a 3-coin 20th anniversary silver set and 19,145 in 20th anniversary gold and silver set. In 2007, 621,333 were sold with 436,702 sold in 2008. First used on the 1916-1947 Half Dollar, the obverse of all of the Silver Eagles contains Adolph A. Weinman’s Walking Liberty design. It is considered one of the most beautiful designs to ever be struck on a coin of the United States. Surrounding the design will be the inscriptions of LIBERTY, IN GOD WE TRUST and the year of 2011. John Mercanti designed the reverse which shows a heraldic eagle with shield along with the inscriptions of E PLURIBUS UNUM, UNITED STATES OF AMERICA, 1 OZ. FINE SILVER and ONE DOLLAR. The "W" or "S" mintmark is also on the reverse. The silver coins sales figures page will contain current sales numbers for the Eagles, when available. Melt values for the strikes based on the current silver market are also shown.